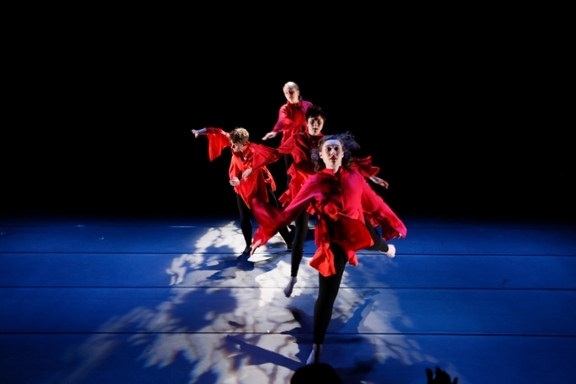 The department produces two concerts of student choreography each year and Reed dancers regularly participate in Reed Arts Week, perform in student thesis productions and undertake independent projects. Dance faculty choreograph for the Contemporary Performance Ensemble, and Reed dancers create choreography for the student-run Reed Dance Troupe. Open through audition, Reed dancers perform in works choreographed and directed by dance faculty and guest choreographers. Each semester the dance department produces a concert of Reed student choreography created both in and out of class. Dance and Dance/Theatre majors choreograph and present evening’s length performances of their own work as part of their senior thesis projects. The student run Reed Dance Troupe rehearses weekly and presents choreography throughout the year. Reed students pursue many independent projects, often with the support of the Dance Department, Reed Arts Week, the Kaspar T. Locher Summer Creative Scholarship, the Jim Kahan Performing Arts Summer Fellowship, Reed President's Summer Fellowship, or the Reed Fellowship for Winter International Travel.